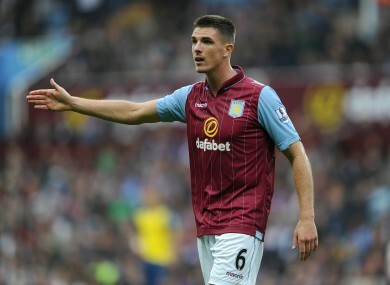 ASTON VILLA DEFENDER Ciaran Clark will miss Sunday’s FA Cup semi-final clash against Liverpool while there are genuine fears that he may not play again this season. The Republic of Ireland international damaged his medial ligament against Tottenham last week and the injury could derail the rest of his campaign. The 25 year-old was forced off after just 18 minutes of the 1-0 win. Should Clark fail to return to full fitness before the end of the season, he may be forced to miss out on his country’s next Euro 2016 qualifier against Scotland on June 13th. Two days before, Martin O’Neill’s side take on England in an international friendly. Clark has come in for some fulsome praise from Villa boss Tim Sherwood for his performances this term, in spite of being part of an ever-changing defensive unit. There was better news for another Irish international with Sherwood confirming that Shay Given will start at Wembley this weekend. A world of Kurt: Could Zouma be used to stop Marouane Fellaini? Email “It has not been a good day for one of Ireland's most promising defenders ”. Feedback on “It has not been a good day for one of Ireland's most promising defenders ”.